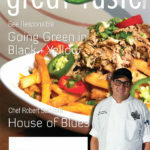 Chef Robert Sarstedt, Corporate Executive Chef to the House of Blues, brings a whole life of cooking to the kitchen. With 12 years of BOH experience and a nationwide list of restaurants under his belt, Chef Robert is a non-traditional powerhouse when it comes to management style. food-driven shows, and you’ve got more than a full plate. But Chef Robert revels in turning what could be chaos into a fine-tuned machine. He says he enjoys the fluid movement of a fast-paced environment and that’s what led him to work for big-chain restaurants like House of Blues and, formerly, The Cheesecake Factory. Chef Robert says his cooking style is current, resourceful and creative. He takes kitchen-style influence from Chef Lee Hefter, whose food quality and standards are far better than Chef Robert says he’s ever seen. But his management style differs from the Wolfgang Puck giant, who’s been said to put the fear of God in those around him. operations; often balancing compassion with a firm and consistent management style. He says his greatest achievement (other than getting his first Executive Chef’s coat with his name on it) is when he’s able to transfer his vision and knowledge to his staff and make an impact on their culinary experience. quickly moved up the ranks. But he hasn’t forgotten where he started: baking brownies with his mom in their kitchen and falling in love with cooking. culinary heroes is his father-in-law, Chef Guy Calluaud—a Texan Restaurateur and Chef with over 40 years of experience. “He deserves all of the credit in the world,” Chef Robert says. They are very close and cook side by side every week for Sunday supper. Chef Robert lives in L.A. and when he’s not traveling, you can find him building puzzles and Legos with his daughter. ADVICE YOU GIVE TO STUDENTS INTERESTED IN THE HOSPITALITY AND CULINARY INDUSTRY Showing up is half the battle; don’t give up.